Manufacturing output continues to improve, even though the number of manufacturing jobs in the U.S. continues to decline and this trend will not stop. Jobs are not going overseas only, in fact, machines are replacing most jobs. As this trend is in the early phase, the momentum will continue to build in the years to come. Machines are faster, cheaper and don’t complain; at least not yet. So from a cost cutting and efficiency perspective, there is no reason to stick with humans. This, in turn, will continue to fuel the wage deflation trend. Sal Guatieri an Economist at the Bank of Montreal in a report titled “Wage Against the Machine,” states that automation is responsible for weak wage growth. Guatieri goes on to state that “The defining feature of a job at risk from automation is repetition”. This puts a lot of jobs at risk, many of which fall under the so-called highly skilled category today; for example, Accountants, Lawyers, Radiologists, X-Ray technician, etc. 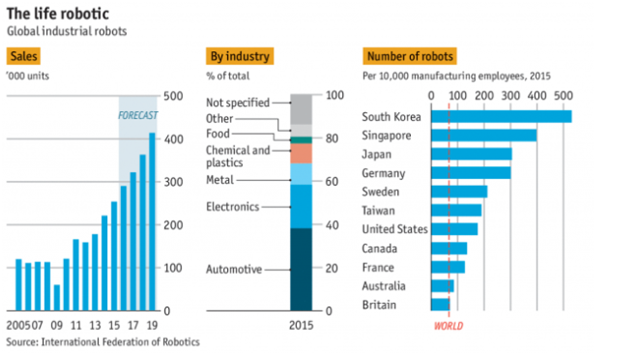 In 2016, they order 35,000 robots, 10% more than in 2015. But that is nothing compared to China, which ordered 69,000 robots in 2016, South Korea ordered 38,000 and Japan for its small size ordered 35,000 robots. This proves that jobs are not going overseas but are being taken over by machines. Nothing will stop this trend; a trend in motion is unstoppable. The largest user of robots is the automotive sector; in North America, over 20,000 of the 35,000 robots went to the automotive sector. Once upon a time, over 80% of the work done in this sector was done by humans, but robots perform today over 80%. 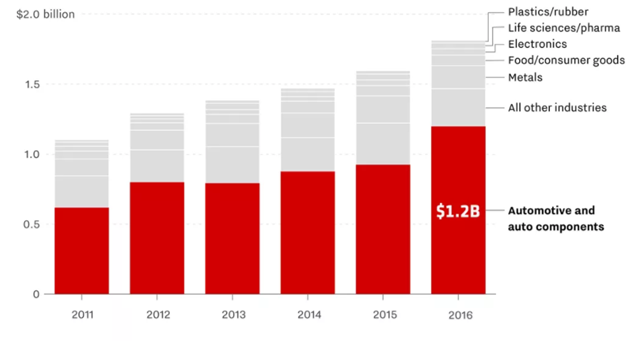 The number of robots sold in the US will jump by 300% over the next nine years, according to the ABI research. It’s simple math; more automation equates to fewer jobs. One industrial robot replaces about six jobs. For now, the automotive industry continues to lead the way, but as companies are pushed to become more competitive, we expect companies in every sector to embrace automation. In 2010 the average cost of a robot was $150,000; today the price has dropped to below $25,000, a drop of over 80%. As prices drop more companies will seek the efficiencies that come with using robots. A day is fast approaching where the price could drop below $5,000 suddenly making them affordable for almost any small sized business. Unions continue to push for higher minimum wages while the purchasing price of robots continues to decline; a deadly and probably fatal punch for the majority unions. In the era, where raising prices is not an option, the only leeway most businesses have is to cut costs. The human factor is the most expensive factor in any business, and that is where the focus will be going forward. The introduction of machines and tools created a significant demand for unskilled labor (it rose from 20% of the workforce to 39% from 1700 to 1850). Machines either pushed craftsmen out of the labor market completely, or encouraged employers to decrease their workers’ wages. The Economist cites this exact situation in which wages fell drastically in the early 1800s, not recovering until 1960. As machines replace humans, the cost of producing goods will drop, and as more people will be competing for the remaining jobs, wages will trend downwards. Wages will rise in some specialised sectors, but these jobs will demand a specialised set of skills, for example, robotics. It appears that AI will only exacerbate the current situation in the years to come. Therefore, deflation and not inflation is what we might have to deal with for years to come. This entry was posted in AI, Investing, Robots by Alberto Mancini. Bookmark the permalink.